I recently posted the following item at Dominican Liturgy, but it has been suggested that readers here might also find it interesting. other Latin rites, such as the adoption of the reformed hymnal of Pope Urban VIII, did conform to the new Psalter arrangement of the Psalms in 1923. My recent historical work on the history of the Dominican lay brothers (today called “cooperator brothers”), included reading through the nine volumes of Acta of the Dominican General Chapters from 1220 to 1843. As I was doing this, I noted the legislation that reformed or modified the liturgy. Here are the major reforms. 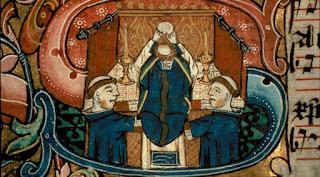 For me, the most interesting piece of legislation was not directly liturgical, but involved the preparation of priests. 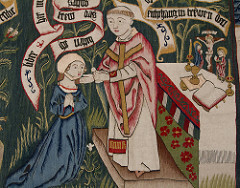 In 1345, the General Chapter at Manresa, required that the prior of the local priory (priestly formation was the responsibility of each priory in those days) make sure that any friar to be ordained “understand the Canon of the Mass from the Te igitur to the Pater noster.” Ignorance of the meaning of the Latin was such a problem that neither subpriors or vicars were allowed to make this decision. But now on to liturgical changes. Today some of the most controversial issues for Catholics in church involve how to show respect to the altar, cross, and Blessed Sacrament. In the Middle Ages, the profound bow was the usual way of showing respect. 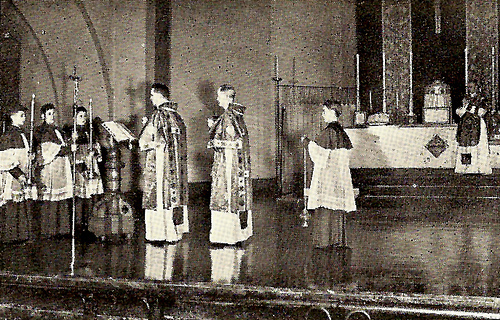 The Dominican Rite only slowly adopted genuflection that became the Roman practice in the later Middle Ages. The General Chapter of Rome 1569 (Acta Capitulorum Generalium S.O.P., 5: 90) explicitly required that the priest bow (“inclinet”) after each of the Consecrations, a clear sign that some Dominican priests were imitating the Roman practice of genuflecting. This chapter also strictly forbade the priest to say the Words of Institution in the Canon out loud, “which certain priests are doing contrary to many chapters and the decree of the Council.” It was only some forty years later, at the Paris General Chapter of 1611 (ACG 6:145) that the Dominican Rite finally suppressed the use of bows at the Consecration and Elevation, replacing them with the modern four genuflections. This was also the point that the rite adopted the use of a genuflection before and after touching the Sacred Species, a practice often considered traditionally Dominican. Introduction of genuflections where the medieval Dominican Rite prescribed bows had actually begun earlier than that. For example, the General Chapter of Rome 1569 (ACG 5: 90) instructed the priest to simply bow while all others present knelt at the words Incarnatus est in the Creed. Rome 1580 (ACG 5: 192) then introduced kneeling at the word “procedentes” in the Epiphany Gospel, during the Te Deum, and at the word “vereremur” in the hymn Tantum Ergo, “following Papal Chapel’s example.” And finally the chapter of Lisbon in 1618 (ACG 6:300) confirms for general use the “pious custom” in Spsnish provinces of kneeling at the words “Eia ergo” in the Salve Regina. Early modern chapters also changed the texts of the medieval liturgy and modified rubrics to conform to Roman practice or developed theology. For example, the Rome Chapter of 1569 (ACG 5: 102) changed the collect of Pope St. Gregory the Great from “ex poenis aeternis” to “ex poenis purgatorii,” to reflect the developed doctrine of Purgatory. Famously, and against considerable resistance, the Chapter of Rome in 1589 (ACG 5: 281) mandated the reading of the Last Gospel at the end of Mass, as in the Roman Rite. Later, the chapter of Rome, 1656 (ACG 7: 390) required that the priest at Solemn Mass read the Gospel quietly before deacon chanted it, duplication finally made optional by rubrical reforms in 1960. I find nothing about the priest’s reading the Epistle quietly at sung Mass. Probably introduced by custom about this time like the Gospel. Another change in practice, that of Rome 1656 (ACG 7: 394), which required the priest to say the Sign of the Cross and the verse “Confitemini Domino” in a loud voice at Low Mass, which explains this practice during the use of the “moderate” voice during the Prayers at the Foot of the Altar, something I have often wondered about. days of Humbert of Romans in the thirteenth century. Take, for example, the lighting of the Sanctus Candle during the Canon at Low Mass. This was not made obligatory until the Rome Chapter of 1580 (ACG 5: 169), although it does seem to have been a custom at Solemn Mass already. This introduction was again approved at Lisbon in 1618 (ACG 6: 296). Bologna 1625 (ACG 6: 241) introduced the wearing of the cope and stole when incensing the Sacrament during Benediction, as well as requiring the singing of the Litany of the Blessed Virgin during the procession after Compline on Saturdays. 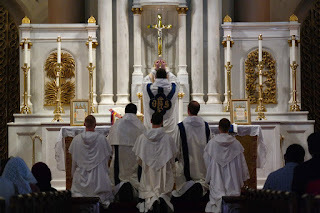 Finally, in 1622, the Chapter of Milan (ACG 6: 325) introduced the “Dominican” practice of moving to center of the altar for the Dominus vobiscum when Mass is before the tabernacle so that the priest’s back not be turned to the Sacrament. This is a clear sign that Dominicans were adopting the modern practice of reservation of the Sacrament on the main altar. 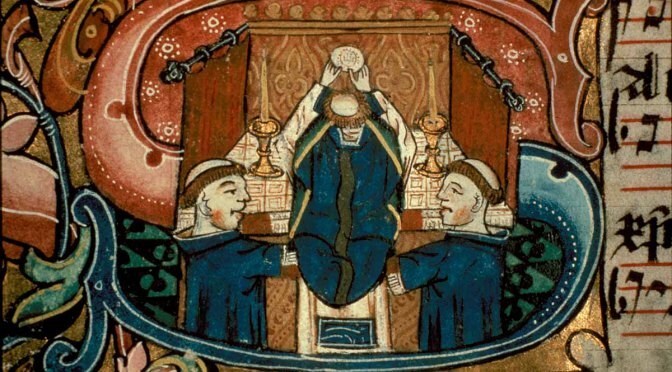 This chapter also introduced the practice of priests wearing the stole over their cappas when receiving Communion on Holy Thursday, as well as placing over the cappa of a deceased friar prior to interment. I had always wondered about the origin of the idea that medieval friars broke sleep to rise for “Midnight Matin” and then returned to their cells for a couple hours rest before Lauds. This was not the case. 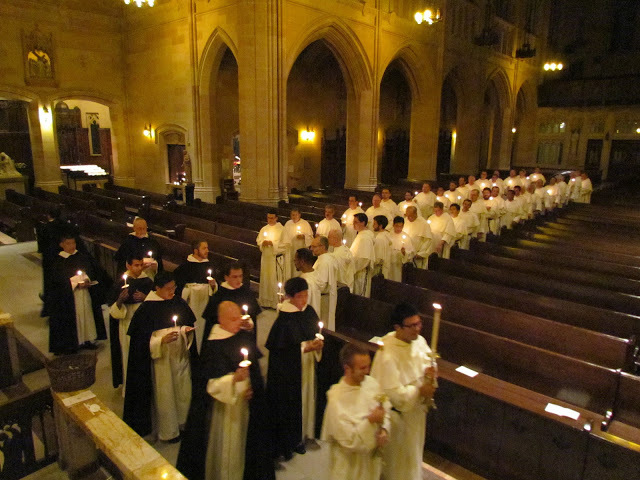 In the Middle Ages, the friars rose early, usually around 3 a.m., to sing both Matins and Lauds together, finishing before dawn. I now know that the first example of breaking sleep is only witnessed at the Chapter of Valencia in 1647. It was then confirmed at Rome in 1650 (ACG 7: 282), where the usus of rising for Midnight Matins is required of all priories in the order, “according to the custom of the provinces as to when midnight is.” This is the first time Matins is separated from Lauds as a “midnight” office. But small houses, at least, could rise before dawn for the traditional single office of Matins-Lauds. In the north the combined office of Matins-Lauds should be at 4 am in winter and 3 am in summer, as it was usually in all the middle ages. I have also found some interesting legislation on music and the use of the organ, but will save that for another post. As I cannot, for some reason unclear to me, post or reply to comments in the NLM combox, you may post your comments here.